We believe that team based competition brings out the best in everyone. 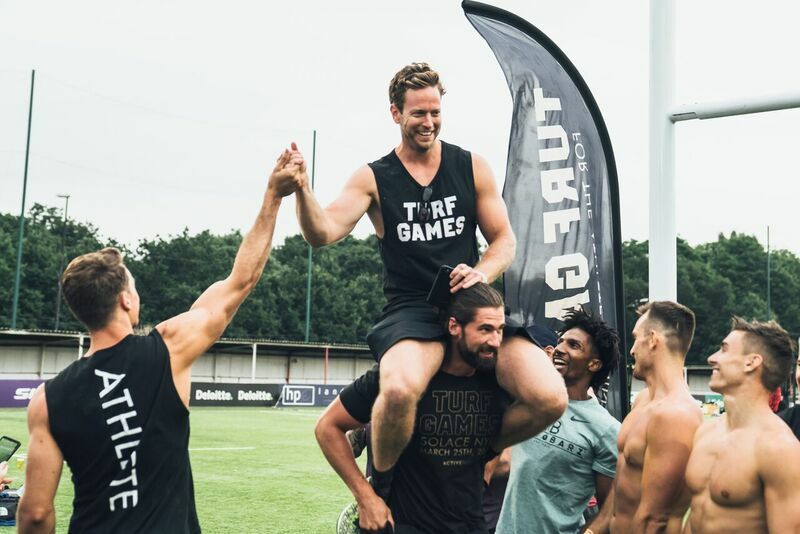 The Turf Games is London’s first functional fitness and TEAM based immersive competition, where guys and girls across all levels of fitness can lift, run, flip, press and jump to try and outdo the competition. 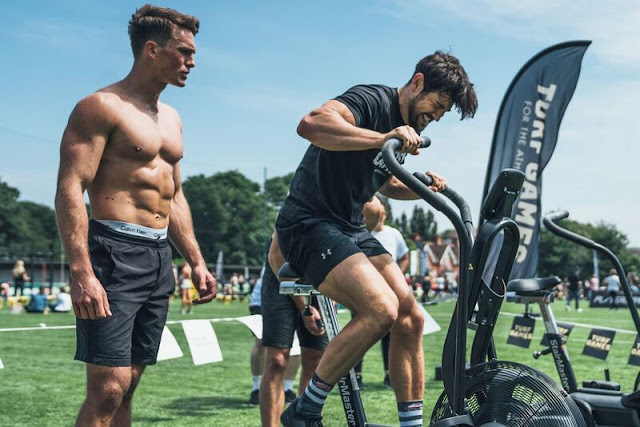 Considering last years first ever Active In Style / Active Man event at Farm Fitness as one of the best fitness events I’ve been to (and I’ve been to a lot! ), although there’s been a number of meetups and workouts since then, nothing has ever quite been on the same scale. Until now, that is! 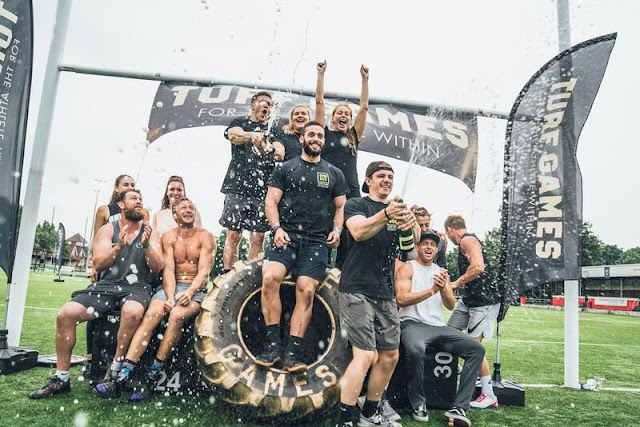 With five different studios on board, on Satuday 9th June over 300 ‘athletes’ gathered to take over the games pitch at Rosslyn Park, battling against one another to be crowned the winner of the first ever Turf Games 2018! With each of the five partners (Third Space, KXU, Core Collective, Farm Fitness and Gymbox) kitting out their own ‘arena’, every studio had to design a workout compiled of no less than three ‘measurable’ stations. With participants competing in teams of five, each station involved four minutes of work, followed by four minutes of rest, before moving onto the next station (three total), then moving on to the next arena (three total). Sound easy? Ha, think again… you haven’t heard the workouts yet! 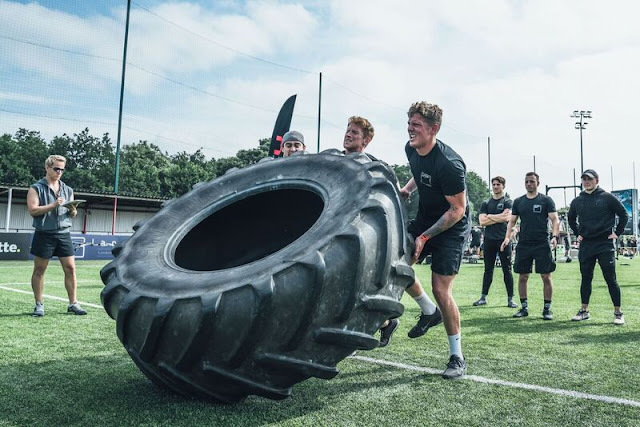 Despite being advertised as exercises that ‘anybody who has been to a gym or played sport will be able to do’ – I think many of us involved would beg to differ! It wasn’t so much the volume of exercise – let’s face it, I could work out at a moderate intensity for most of the day (and often do!!) – but it was the heavy weights that posed the biggest challenge. Take Core Collective, for example, which was our first arena. Station one was a ‘chipper’ style workout, meaning you couldn’t move on to the next exercise until the previous one had been completed. Completing 20x40m runs unlocked the first rower, then 40 x 20kg (yes, 20kg!) would unlock rower two. 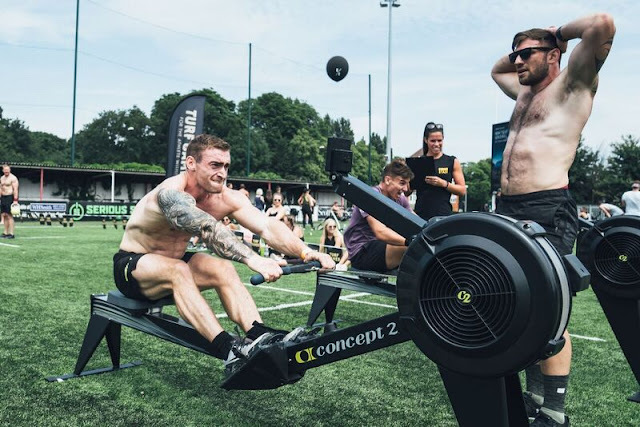 After 20x20kg over the shoulder deadballs, the third and final rower would be unlocked. The catch? All three rowers were to go consistently, and it was their cumulative distance that provided your score. 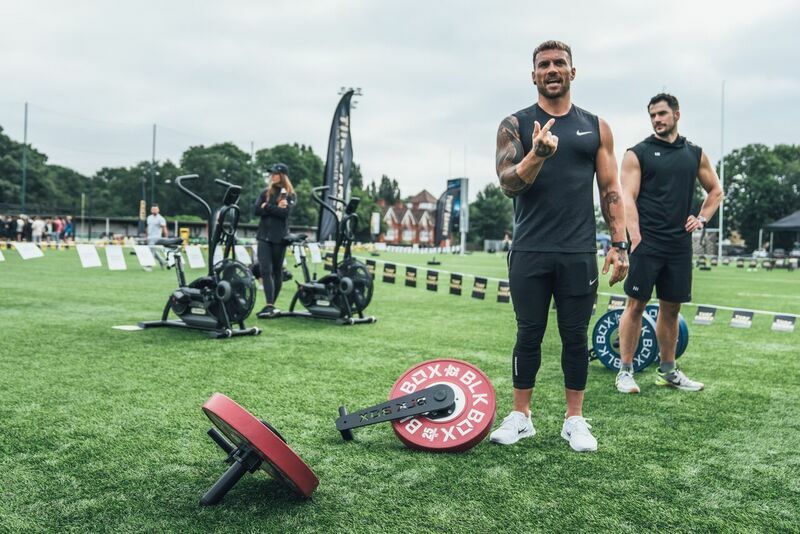 For that station, anyway…..
Station 2 was a ‘synchro squat’ round, where teams had to squat 2x12kg each in unison, for four minutes, whilst other team members held a 30kg bar bell above head height. Bar goes below the eyes and you lose eight points! Onto station 3 and it was Watt bike burpees. Two exercises that should NEVER, EVER be paired together! 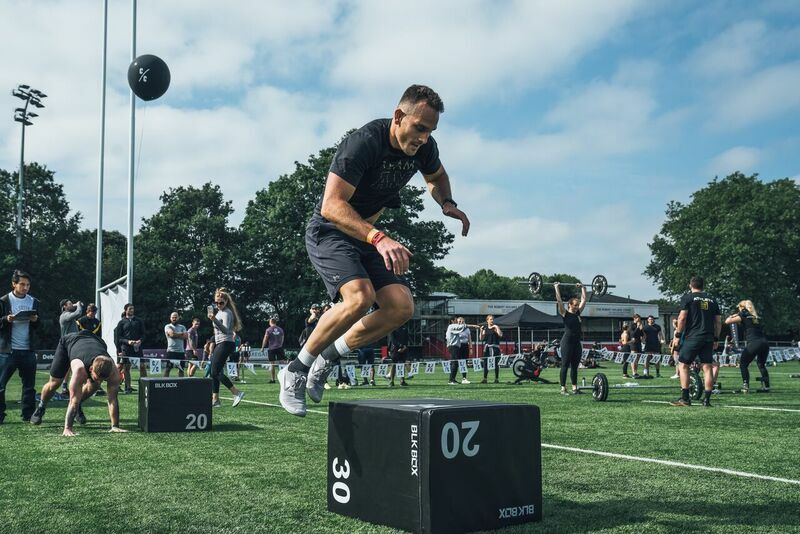 1 minute on the watt bike into one minute of box jump burpees – it may sound short and sweet – but trust me, your legs will not agree!! Next up for team Third Space was KXU…. Where lifting heavy was taken to a new level! Station one was ‘Drovers Dog’ - 30kg, 40kg and 50kg sandbag carries up and down the pitch, the whole time moving the weighted prowler sled up and down for reps. Station 2, ‘Flip It Like It’s Hot’ was where we REALLY got our team game on, pulling together to flip the 350kg tyre for maximum reps. The arm bruises say it all! Finally, it was on to station 3, by far the heaviest and hardiest of them all. Even the machine of the team Louisa, who completed the synchronized squats all by herself (!) struggled with the weight on this one, and it was Sarah who pulled us all through with her epic 28kg Axle bar push presses, sandwiched in between 22kg log presses and 16kg kettle bell snatches, of course. Sore, bruised, but still riding high, we moved on to our third and final station, none other than Third Space itself. Needless to say, this is the arena we felt most at home at, and probably performed best at! Round 1 was the Versa Climber (which often makes an appearance in Third Space Sweat X) paired with overhead kettle bell lunges. Sandwiched in between, however, was the real highlight, and where all of our bars and ropes practice came into play! 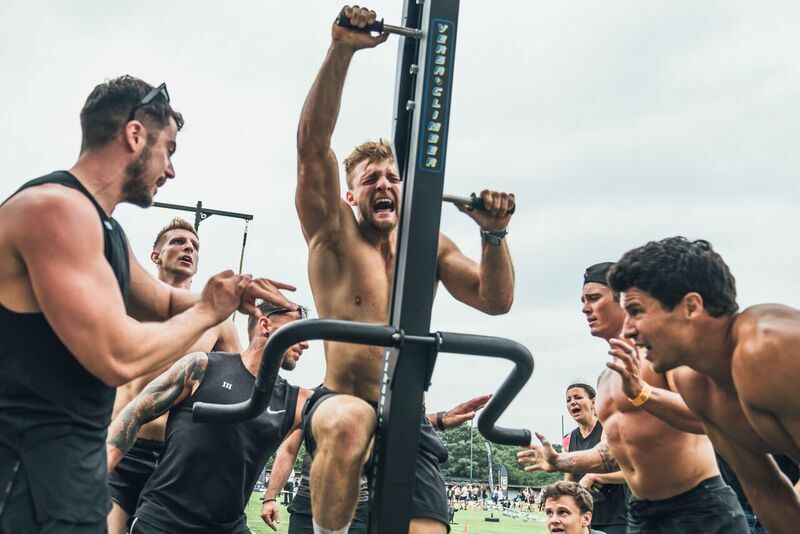 An assault course style station, it involved monkeying your way down the bars, climbing the rope, sprinting to the cone for 5 squats, box jumping to the end, to hold a 50kg barbell, keeping it off the ground for the full 4 minutes. 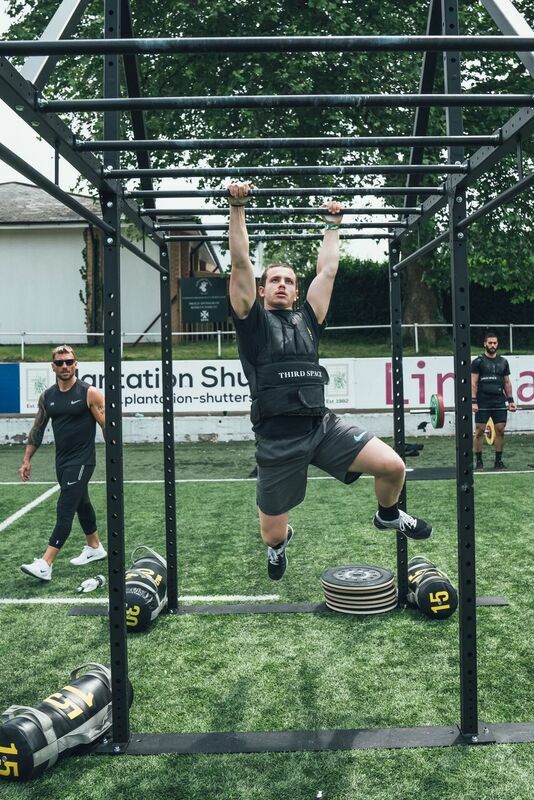 Oh yeah, as if monkey bars and rope climbs weren’t difficult enough, the full course had to be completed wearing a 5kg weight vest!! Third and final from Third Space was ‘Turn and Burn’. Two Airdyne bikes, once the first one hits 80 calories, it stops and the farmers walks – 20kg in each hand – begin. The other bike, meanwhile, continues, and this is the scoring bike that continues for the duration of the 5 minutes. If you’ve ever been on an airdyne bike, you’ll know just how brutal this is. With every team having now completed three out of the five arena’s, the scores were counted and the teams going through to the finals were announced. Given the groups of PT’s, instructors, cross-fitters and actual athletes we were up against, we were in no means surprised (or disappointed!) that we didn’t get through to the final, but admittedly did feel a somewhat sense of achievement that we were only four points away from it! Standing at the sidelines watching the finals, we were mega glad we didn’t get those extra four points. If we thought what we had just completed was brutal, to have to do what these guys did AFTER would have killed us off!! 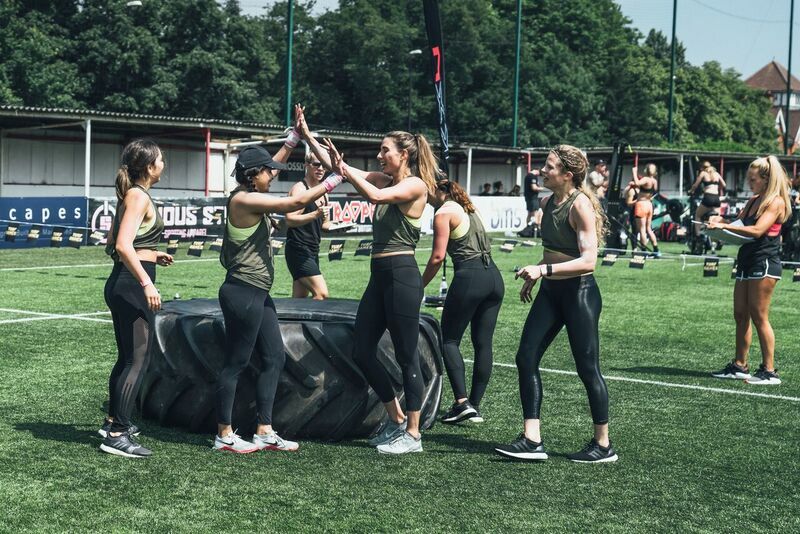 A most definitely well deserved win from Team Hel’s Angels on the girls, F45 Tottenham Court Road on the mixed, and Cocobro’s from the boys. So, that leaves the question… would I do it all again next year? In all honesty, I’m not sure. Don’t get me wrong, it was an absolutely incredible day, bringing together and strengthening so many familiar faces of the fitness community, yet in all honestly I left feeling somewhat… inadequate. For me, the weights were simply too heavy. 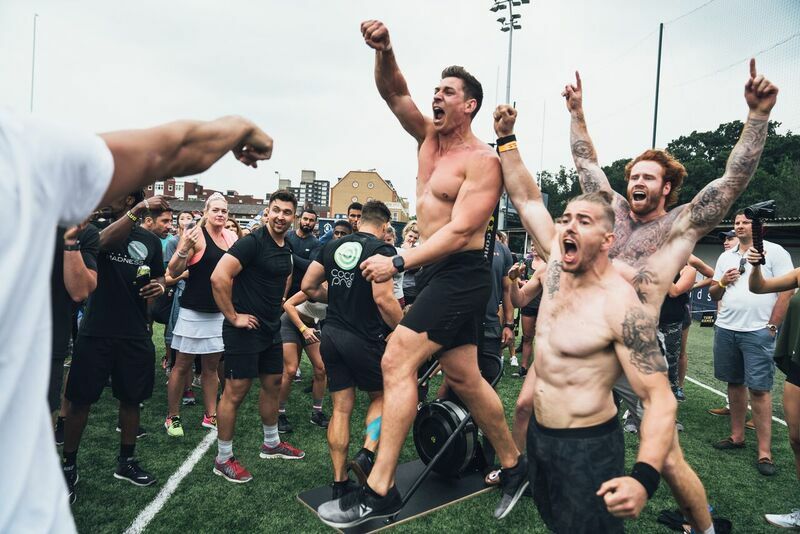 So heavy that a lot of them I couldn’t physically do… looking around at all the strong, powerful people around me, lifting almost with ease, and I had to reminder myself that actually, competing isn’t what I do. Fitness isn’t my living, it’s my hobby, my training isn’t dedicated towards achieving a new PB, time or distance…. yes, I enjoy keeping fit and healthy, but I also enjoy the social element, the endorphin rush, feeling part of something bigger than myself. That’s not to say I don’t believe in training towards a specific goal. In fact, if Turf Games has taught me anything it’s that I need to be working smarter. Less cardio, more weights, more progression… and more recovery. So potentially next year I will be feeling strong enough to compete. … and if not, rather than beat myself up about ‘not being good enough’ to lift the same as the professional PT’s and ahtletes, I’ll be right down there to cheer on them all on! 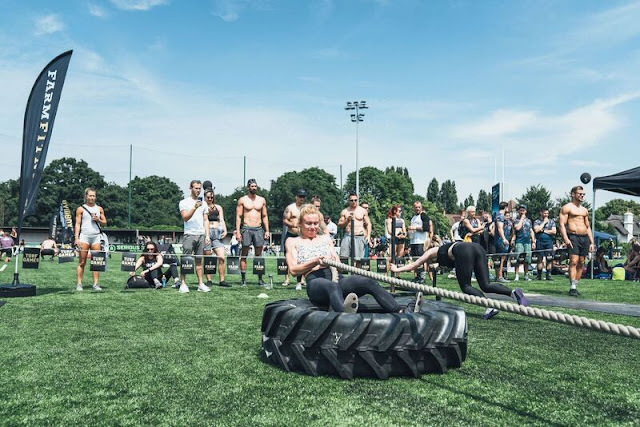 From the Whey Box Protein Stand, Fresh Fitness Food BBQ, Esquared sponsored Bar, festival vibe music, and all round upbeat, positive and happy vibes all round, it is a day I would not miss! Huge thanks to Andy Manteit, Caroline Lucey and Georgie for organising such an amazing event, Third Space, KXU, Core Collective, Farm Fitness and Gymbox for being ever more brutal than ever, Whey Box, Fresh Fitness Food, Barebells and Noco for refueling us, Esquared for sponsoring the bar to 'rehydrate' us, my fellow team members for being machines, Third Space London for training us/branding us (! ), and all the other amazing people who made the day what it was!